Let us help you book your ultimate retreat or fishing adventure. Choose from salmon or halibut fishing, fly fishing for trout, watching whales and other wildlife, or Eco heli tours of pristine marine environments. 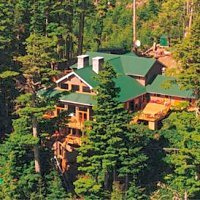 Our deluxe BC resorts are located in the remote Queen Charlotte Islands ("Haida Gwaii") and the Chilcotin country in the interior. We thrill hundreds of guests annually with four of the finest fishing and adventure destinations available. Langara Fishing Lodge, the first 'fly-in' fishing lodge in the Queen Charlotte Islands, is 'the trip of a lifetime' for the ardent angler. An unbelievable adventure offering world class fishing with five star cuisine and full service." 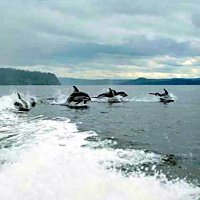 Nearby Langara Island Lodge is 'the ultimate retreat', unique in combining world class fishing with the very best in service, dining, and accommodations. Enjoy the splendor, serenity and exclusiveness of this luxurious lodge experience. Moosehead Lodge is our "Wild Rainbow Trout Lodge" located in the heart of remote Chilcotin Country. Choose to explore Moose Lake in search of Wild Rainbow Trout, watch the wildlife, venture to other remote lakes, or just relax. relaxed atmosphere all contribute to an unforgettable stay. For those who want to add more excitement to their Langara Adventure... the Outpost at Rennell Sound on the West Coast of Graham Island is ready for you. Activities can include fresh water fishing to river estuary fishing, kayaking, crabbing and beachcombing. Some shorter heli-ventures are also available including a visit to see a working lighthouse. Langara Lightstation is one of the few manned lighthouses left on the coast of British Columbia. Meet the lighthouse keeper, take a tour around the scenic grounds, and experience what it is like being the only people around for miles. On a clear day chances are good for seeing the islands of South East Alaska just 24 nautical miles away! To round out your excursion, feel free to go beachcombing or on a hike to see the wonders of a natural rainforest. 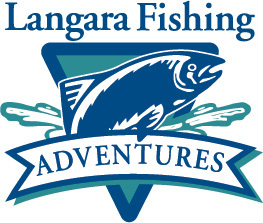 Langara Fishing Adventures is dedicated to providing the ultimate retreat or fishing adventure that you will always remember. "Tight Lines and Happy Landings".